The AEC team brought excellence to a new level by successfully repairing a landslide-impacted area on private property in Camas, WA. Project Manager Kelly Kellogg bid and won the project and our crews worked closely with the general and our various subcontractors to ensure a safe and efficient project. 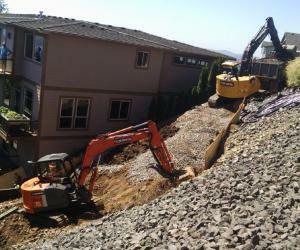 The worksite was located on a precipitous slope and in direct proximity to high-end homes. The property owners’ home lay uphill of the affected area and the neighboring property, which was endangered by the December 2015 slide. Access to the site was precarious given the limited clearance to the structures. AEC was given a clearance of only 10 feet in some areas, and some of our equipment necessary to perform the work was up to 10 feet wide. Crews began by excavating soils in order to create access routes to the slope area and followed with the excavation and removal of approximately 360 cubic yards of soft soil. We then imported roughly 550 tons of Gabion rock and structural fill material. Additionally, a soldier pile wall was constructed to stabilize the hillside and AEC installed a drainage ditch with French drain at the base of the wall. The purpose of the drain is to control erosion by redirecting the groundwater from the area, thus minimizing the risk of future slides. The ditch was lined with fabric and filled with drain rock. Congratulations to our team for safely completing such an exemplary project!